Tesla reported today that the National Highway Traffic Safety Administration (NHTSA) is opening a preliminary evaluation to see if Autopilot worked according to expectations after a recent crash resulting in the death of a Model S driver. According to Tesla's statement, the driver had Autopilot activated when a tractor trailer crossed the highway, however neither the driver nor Autopilot could see the white side of the tractor against a brightly lit sky and did not apply the brakes which resulted in the car's windshield hitting the bottom of the trailer. The high ride height of the trailer combined with its positioning across the road and the extremely rare circumstances of the impact caused the Model S to pass under the trailer, with the bottom of the trailer impacting the windshield of the Model S. Had the Model S impacted the front or rear of the trailer, even at high speed, its advanced crash safety system would likely have prevented serious injury as it has in numerous other similar incidents. When asked why the radar sensors didn't recognize the truck and apply brakes or change trajectory, Elon Musk explained that the radar tunes out what looks like an overhead road sign to avoid false braking events. Tesla and Elon Musk extended their condolences to the family of the victim, saying the driver was a friend and a long time EV supporter. According to The Verge, the accident occurred on May 7th in Williston, Florida with 40-year-old Ohio resident Joshua Brown, who recorded a video of his Tesla Model S’ autopilot saving him from a crash back in April. NHTSA said it was working with the Florida Highway Patrol in the inquiry into Mr. Brown's fatal accident. The agency cautioned that opening an investigation did not mean it believe there was a defect in the vehicle being examined. 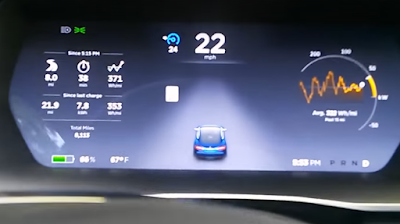 Tesla has repeatedly made it clear to drivers to keep their hands on the wheels at all times as Autopilot is still in beta phase. In fact, every time that Autopilot is engaged, the car reminds the driver to "Always keep your hands on the wheel. Be prepared to take over at any time." The system always checks the driver's hands remain on the wheel and provides visual and audible alerts if hands-on is not detected. It then gradually slows down the car until hands-on is detected again. Tesla says owners of its electric vehicles have driven 130 million miles using its autonomous Autopilot feature. There has been one fatality worldwide for approximately every 60 million miles. Tesla's director of Autopilot Programs Sterling Anderson was at the EmTech Digital conference last month speaking on the MIT Tech Review panel about "delivering the Promise of Autonomous vehicles" in San Francisco. He told the audience that the data collected from those trips is being analyzed to improve the Autopilot function and introduce more upgrades. He warned that Autopilot cannot legally replace a driver as of yet and insisted that it "should be used with a driver fully engaged, fully in the loop, using their cognitive abilities as they normally would". In addition, he advised drivers to "stay very in tune with the set of scenarios the car doesn't handle well" adding that they "should be very engaged and be prepared to take over." Tesla was forced recently to deny, in a statement, a rumor of NHTSA investigation into suspension failure on its Model S after a blogger mounted a smear campaign against the company. 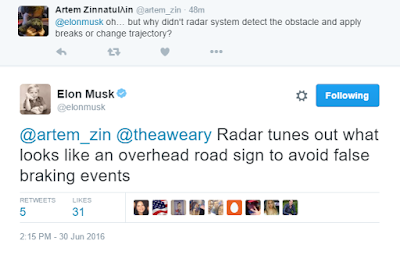 Elon Musk then went on twitter to clarify that 37 of 40 suspension complaints to NHTSA were fraudulent and registered to false locations or vehicle identification numbers, adding that NHTSA have found no safety concerns with the Model S suspension and have no further need for data from Tesla on this matter. You can read Tesla's full statement below.